For some this name will ring a bell. As a person who has grown up and lived in this area, I thought that after 45 years I knew all the stories about this region. But now new information about one of the sites in the area has surpassed my wildest expectations after a recent visit. In the New Scotland area of Mpumalanga and in this case specifically the Mpuluzi region, there has always been a giant footprint imprinted in the rock that over the years has been called by various names. These names vary from "Big Fool' to 'Goliath's footprint" and sometimes even referred to 'Adam" or -Jesus" footprint. 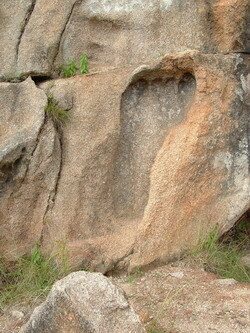 Over the years many people have come to see this giant foot print in the rock near Lothair in the Mpuluzi area. Fittingly, on Freedom Day, the 27th of April 2005. I had the distinct honour of accompanying a group of very interesting people on their visit to this giant fool print. Many people in South Africa know of Dr Kredo Mutwa or 'Baba" Mutwa, as many call him. Well, I accompanied him, his wife Virginia and the international writer David Ickle, who had been my guest the night before at Florence Guest Farms in Chrissiesmeer. I accompanied them to the giant footprint on their request and was amazed at what enfolded during the day. 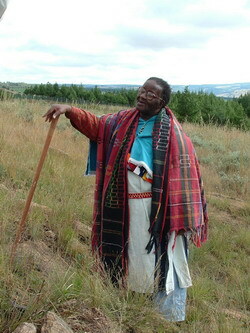 Dr Mutwa, who is 83 years old, is called a San-use in South Africa. He explained that the San-usi is a leader, especially in African spiritualism. On our arrival at the giant footprint, and due to the fact that the giant foot print is situated quite high up on a steep slope, and because of his age and frailty, DR Mutwa was unable to climb up to the site, but rather sat at the foot of the slope, below the giant foot print, and proceeded to tell the most interesting story about this, that we have always called Goliath's footprint. 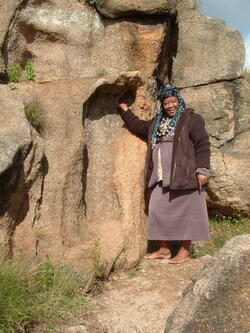 According to Dr Mutwa, the giant footprint is the holiest place in South Africa and is also one of the holiest places in the world. He was seriously concerned and could not understand why the government in South Africa had not yet taken steps to protect and to make this holy place, known to the public. According to him, the footprint is that of a woman's left foot with matching right foot imprint in Sri Lanka. He explained that the footprint in Sri Lanka called "The footprint of Athen". He has visited this footprint in Sri Lanka and explained that on a yearly basis millions of people visit that site in Sri Lanka, hence his surprise that nothing has been done to make this site known to the public. According to him, these were made by giants, and as proof of this is that which is written in the Bible that there were giants on the earth in the past. As he sat at the foot of the slope, he turned to look at the footprint and through his rather thick glasses, stared at the footprint and began to weave an intriguing story. According to the legend Shaka named the area iMpuluzi after he had driven out the Swazis that had settled in the area. Furthermore, he pointed out that the footprint is that of a woman and that her name was iMpuluzi and named as such by Shaka, which means the naked goddess. This giant live in a time, which is lost in the mists of time and that this giant was approximately 36ft(10,97m) high and that her footprint was approximately 6ft (1,8m) long. The imprint of her foot was made as she ran across an open piece of ground that was covered with warm lava ash and that is how the footprint came to be in granite, which is now so prominently displayed on the side of this hill. He went on to explain that iMpulizi was running to her loved one and if one looks at the area one finds just below the hill an enormous rock that has the definite shape of a human skull. According to Baba Mutwa, that is the remains of iMpuluzi's loved one. He explained that in the black cultures of Africa, the skull symbolizes eternity and that even when a person has died many years ago a portion of the skull can never be destroyed. He points to the area in Mpuluzi and the large numbers of giant round granite rock found throughout the area, which according to him is proof of the existence of these giants. The round rocks are the fossilized remains of these giant skulls. Baba Mutwa pointed to the hills surrounding the footprint and explains that this is a place of love, of peace and of healing and that iMpuluzi's footprint is there to serve the power of good. He explains that as a young boy in 1937, he was brought to the footprint of iMpulzi by his mother, after having suffered a severe case of child molestration. iMpuluzi is also a place for marriages and to the surprise of the whole group, right there and then he "married" his second wife with a very simple ceremony. During this ceremony David Icke, who had listened attentively, captured the entire story on video, as according to him, he is busy writing his new book and will produce a DVD, which will cover this wonderful place and its legend. Of great interest is that on various occasions horticulturists and other visitors have pointed out that on this small hill there is an amazing amount of medicinal plants that grow and that one of them, which is called the 'Baboons tail and grows in abundance, can be used to stop TB and to treat asthma. The water that continually pours out all over this small hill and runs over the rocks is referred to as the tears of the gods', or in this case "goddess". Of course this entire story was fascinating to hear but what many people don't know, this is not the first time that iMpuluzi, the giant's footprint, has had special visitors, as previously an entire delegation of native Americans had visited the site and conducted a very "holy" ceremony at this place. So, here I am, on Freedom Day 2005. Leaving iMpuluzi which has once again brought a wonder and deeper searching of the hidden legends of Africa and more specific this area that I thought I knew so well. For a truly unique experience, one should visit this place and experience the awe of this perfectly formed giant's footprint imprinted in granite rock and hear the legend of the giant called iMpuluzi, which makes for a fascinating story. Road to Impuluzi's foot print. At 6km you will get a beautiful view of the typical boulder area which you are travelling in before it was planted with trees this was how the Empuluzi district looked like. At 8km you will cross the Mpuluzi River which starts close to Florence Guest Farm. Just after the river you will see die Busby Eucalyptus oil factory on the left (No Entry). You can see the typical eucalyptus trees on either side of the uphill road. At 12.9km the Lothair turn off to your right (you are welcome to investigate this typical wood industry town. It is only l.lkm gravel road to the footprint. The gravel road will immediately fork but keep left it will fork again but keep right this time on the bigger road. The road are not in good shape, take it slow. At 5,5km you have arrived at IMPULUZI'S site. A Forest signboard will mark the spot.